IBM this week introduced a 16-socket Power9 server monster. The E980 is the most powerful and scalable server in the IBM Power Systems portfolio. It is a follow-on to the E880 and E880C servers, and is vastly more powerful. There are model upgrades from IBM Power9-based E870, E870C, E880, and E880C systems. According to an IBM Red Book, an E980 system is composed of a 2U System Control Unit (SCU) with up to four 5U system nodes. Each system node contains four single-chip modules (SCMs) – these sport an IBM Power9 processor with 8, 10, 11 or 12 cores, and simultaneous multithreading executing up to eight threads per core, at clock frequencies of 3.55 to 4GHz. That is a maximum of 48 cores per system node. An E980 server can have 4, 8, 12 or 16 sockets, or up to 192 cores, meaning a socket equates to an SCM. Each system node has 32 Custom DIMM (CDIMM) slots, and can support up to 16TB of DDR4 memory. Thus a four-node server can have up to 64TB of memory, with bandwidth of 920GB/sec/drawer. The E8880C supported 32TB of memory. The processor has EnergyScale technology with variable processor frequency modes that provide a significant performance boost beyond the static nominal frequency. The server has an integrated IO system with hot-pluggable PCIe gen-4 interfaces. In fact, there are up to 32 PCIe gen-4 x16 slots in the system nodes. 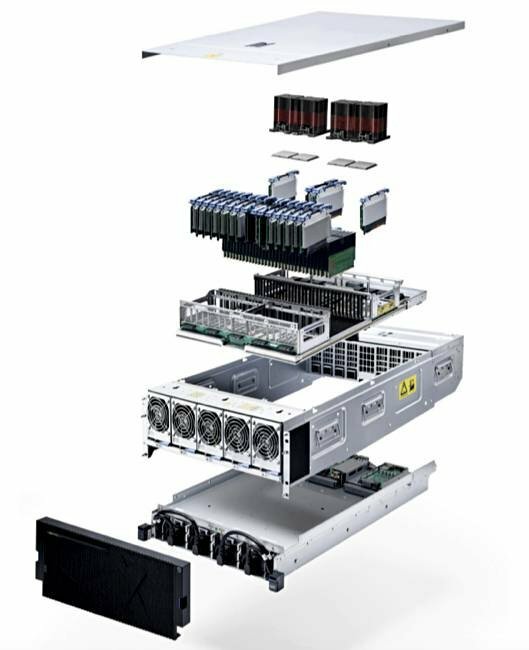 Initially, there are up to 48 PCIe gen-3 slots with four expansion drawers and this will increase to 192 slots with the support of 16 I/O drawers. It uses 12Gbit/s SAS EXP12SX and ESP24SX external disk expansion drawers. It can take up to 4,000 or more directly attached SAS disks or solid-state drives (SSDs). The E980 server can support up to four 800GB hot-pluggable mainstream NVMe SSDs in each system node for boot purposes. There can be up to 1,000 VMs (LPARs) per system. Customers can upgrade processing resources. Either via CUoD (Capacity Upgrade on Demand) to permanently activate additional processors and memory, or via Elastic CoD for a temporary upgrade. Supported operating systems include Linux, AIX, and IBM i.
Dell has a PowerEdge R940xa server using Intel Xeon SPs with up to 28 cores per processor, 112 cores max in a four-socket system. HPE's ProLiant DL580 Gen10 server is also a four-socket Intel Xeon SP box. The E980 has up to 192 cores. And IBM claims its Power E980 system bandwidth can deliver more than twice the performance per core of its competitors, such as Dell and HPE, enabling applications to run faster and be more responsive. Using IBM's numbers, we could say a four-node E980 is equivalent to 3.4 fully configured HPE DL580 or Dell R940xa machines. Big Blue also announced this week an E950: a four-socket, 4U server containing up to four 12-core Power9 processors, and 16TB of memory. That's roughly equivalent to a single E980 system node.